Key services within the Registrar General’s department will be available online as early as June this year, according to Attorney General Allyson Maynard-Gibson, who told attendees at the e-Government & Business Forum yesterday that users of the government portal will soon be able to navigate the various stages of incorporating a company entirely online. In addition to company incorporation, the Attorney General said that applicants will also be able to go online to receive certificates of good standing and dissolution. “We believe those three services will have significant impact on the private sector,” she said, noting that government is committed to its timetable of getting all these services online by the end of 2013. A trademark registry, accredited by the World Intellectual Property Organization, is also expected to come online by the end of the year. Additional services at the registrar’s department are expected to go virtual in the future. 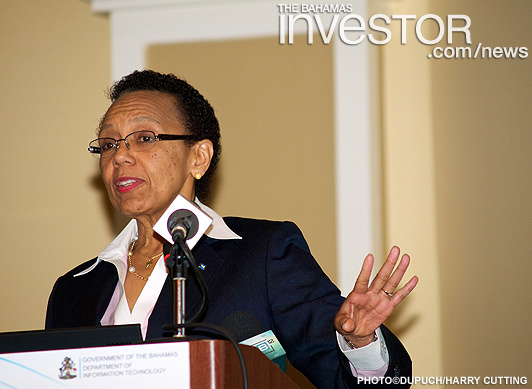 Director of the Department of Information Technology June Collie also addressed the forum, which took place at the Sheraton Nassau. She said that The Bahamas’ United Nations E-Government Survey ranking was 65 in 2012. Her department aims to improve on this by bringing a variety of services online in the next few years to add to the five already in place—renewal of driver’s licences, payment of real property tax, payment of traffic fines, vendor inquiries and online customer service. Those services in the pipeline include application and payment of work permits, and PO Box rentals. The department is also forming a sub-committee to focus on ease of doing business. “We want to create a business friendly environment that could make us globally competitive,” said Collie. During the e-Government & Business Forum held in Nassau yesterday, the government outlined its strategy to take more services online to maintain the jurisdiction's competitiveness. During the 2012/2013 Mid-year Budget Statement in the House of Assembly March 18, Prime Minister Perry Christie underscored the continued contribution made by Atlantis Paradise Island to the Bahamian economy.